Jock problems = I have SO MANY TSHIRTS! I saved every single shirt since high school. In high school, when I was on the crew team, it was always a tradition to make t-shirts before a race but also to buy the shirts at races and that all adds up. Plus I have a ton of crew and running shirts since then. Years ago, I stumbled upon Campus Quilt. At the time, I couldn’t afford it but I thought it was a cool idea (turning t-shirts into usable things like quilts!). Right before the NYC Marathon in October, I decided to buy a quilt. So I did. Quilts come in every single size. 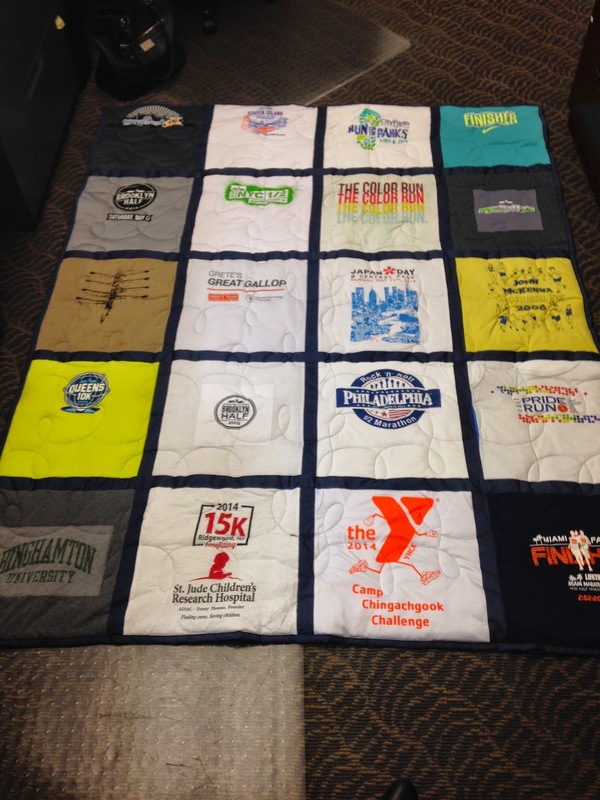 You can get a 9 shirt quilt or a 24 shirt quit! I ended up settling on a 20 shirt quilt in which the base price was $205. There are a lot of things you can add like sashing which is a bit extra. The sashing separates the shirts so it gives it a more fluid feel. The sashing is the dark blue cloth that separates each shirt. Ordering is easy. You order online and put down a $100 deposit and they send you a kit. In a few days, I got the kit which include a sample of the fabrics which you choose to back the quilt and if you choose sashing, it’s the same fabric. In the kit, also comes number stickers so you number your shirts in the order that you want them to appear on the quilt. For example, numbers 1-4 on my quilt are the top row from left to right. Also as you noticed I kept a majority of the white t-shirts in the middle. Within 4 weeks of sending them my shirts, I got my quilt! It was a lot bigger than I expected! Also a lot thicker and nice than expecting plus the stitching is amazing (you can kinda see it in the photo – just look at the white areas of the quilt). Technically I got a couch quilt but the quilt (above) covers my full-sized bed. Plus it was really warm which is perfect for winter. I keep mine on top of my comforter on my bed. 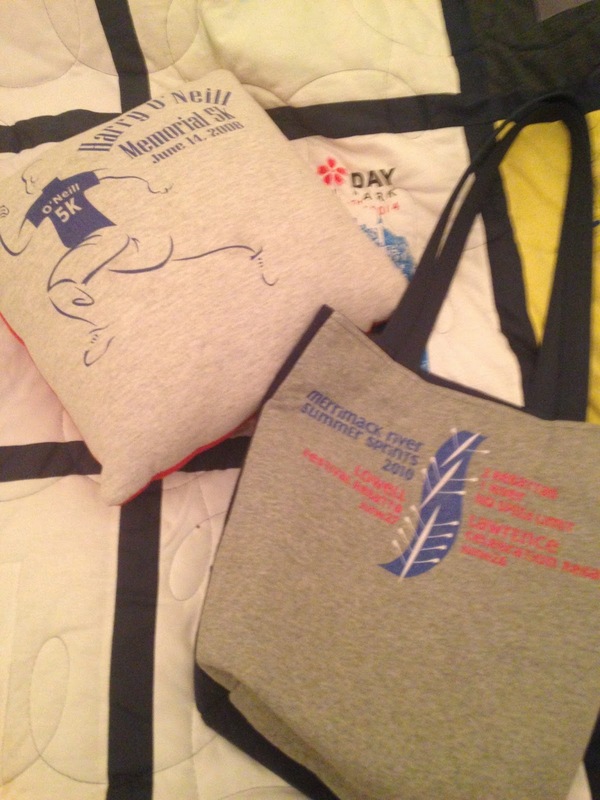 After posting on social media, the team at Campus Quilt reached out to me to also review their tote bag and pillows. It’s the same idea – making your old t-shirts into things you use everyday. They do everything in different sizes except the bag is one size for $39.95. The pillow comes in two sizes either for $45 or $95. The larger pillow must be way larger. Ordering works the same way with pillows and bags, you order online and they send you a kit if you want sashing and that sort of thing. With the handle of the tote, I went with the dark blue again which went well with the shirts. For the smaller pillow and tote, it was a shirt per side. I love the materials of the quilts, bag and pillow. The pillow is really comfy but the bag is very durable (I carry groceries and textbooks in it). What I love about Campus Quilt is that everything is durable. Everything will last a long time so if you’re looking for a great way to turn your shirts into useful things, look no further than Campus Quilt! 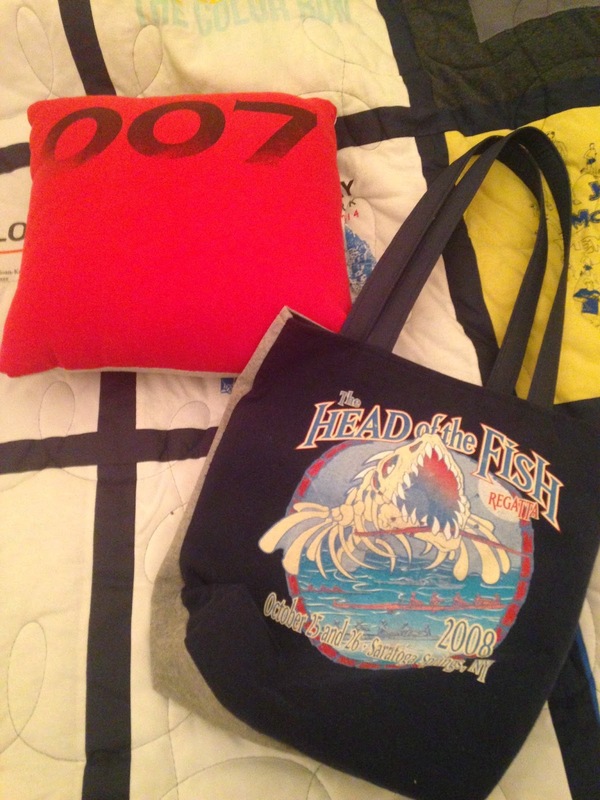 Disclaimer: Campus Quilt provided me with the tote bag and pillow. All opinions are my own. Overall an excellent trip along with a lot to determine as well as perform. I understand We most likely just required pictures associated with fifty percent the actual things presently there. Actually fulfilled several enthusiasts from the tale presently there in order to therefore hi in order to anybody We spoke in order to.